Mostly a coastal plant but found inland as well, L. arborea is recorded from most seaside sites around England and Wales with records thinning out as you go north. It is found in Scotland but far less frequently. In Ireland it is mostly found in the east. 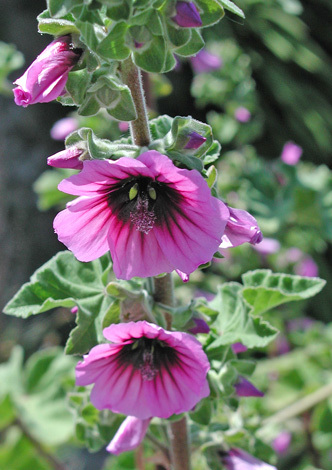 The taxonomy of this plant is being questioned at present with the possibility of it being better placed in the genus Malva and other studies showing that there could be varieties or sub species which have been ignored. It has spread to certain coastal sites where tall stands are tending to hamper Puffin nest sites (burrows in cliffs) and so is regarded by some as an invasive nuisance. The spread of this plant may be due to the fact that it is often grown in gardens and escapes easily. It was once thought to be a useful plant for treating burns using a poultice made of the leaves. 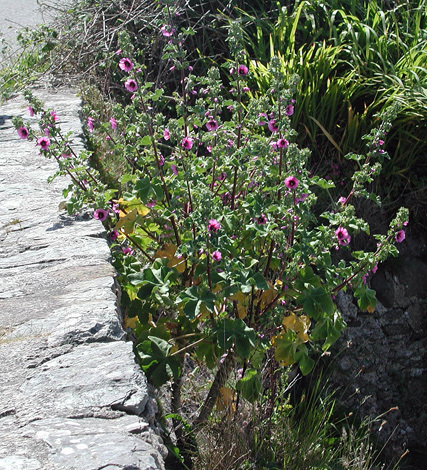 On Anglesey where this one was seen many of the plants are very easy to spot as they grow at the roadside.